Collins Booksellers - Phase Transformations by Michel Soustelle, 9781119178590. Buy this book online. 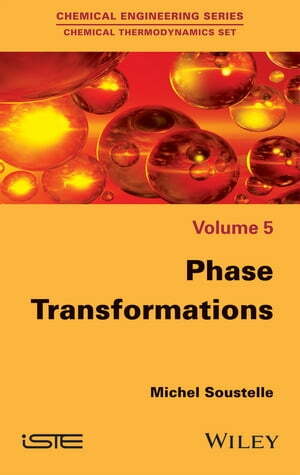 This fifth volume is devoted to the study of transformations and equilibria between phases. First- and second-order pure phase transformations are presented in detail, just as with the macroscopic and microscopic approaches of phase equilibria. In the presentation of binary systems, the thermodynamics of azeotropy and demixing are discussed in detail and applied to strictly-regular solutions. Eutectic and peritectic points are examined, as well as the reactions that go with them. The study of ternary systems then introduces the concepts of ternary azeotropes and eutectics. For each type of solid-liquid system, the interventions of definite compounds with or without congruent melting are taken into account. The particular properties of the different notable points of a diagram are also demonstrated.